Buy BVS Solitaire Collection 8.1 now! 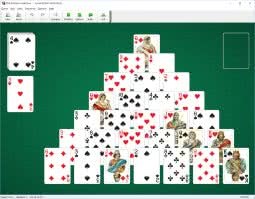 BVS Solitaire Collection 8.1 for Windows XP/7/8/10 is the best collection of 520 solitaire card games with attractive smoothly scalable playing cards. Enjoy all your favorite solitaire variations and learn new games not found elsewhere. And you can modify rules of any game, thus easily creating your own variations. Plus Pack with excellent additional card sets, card backs and backgrounds.